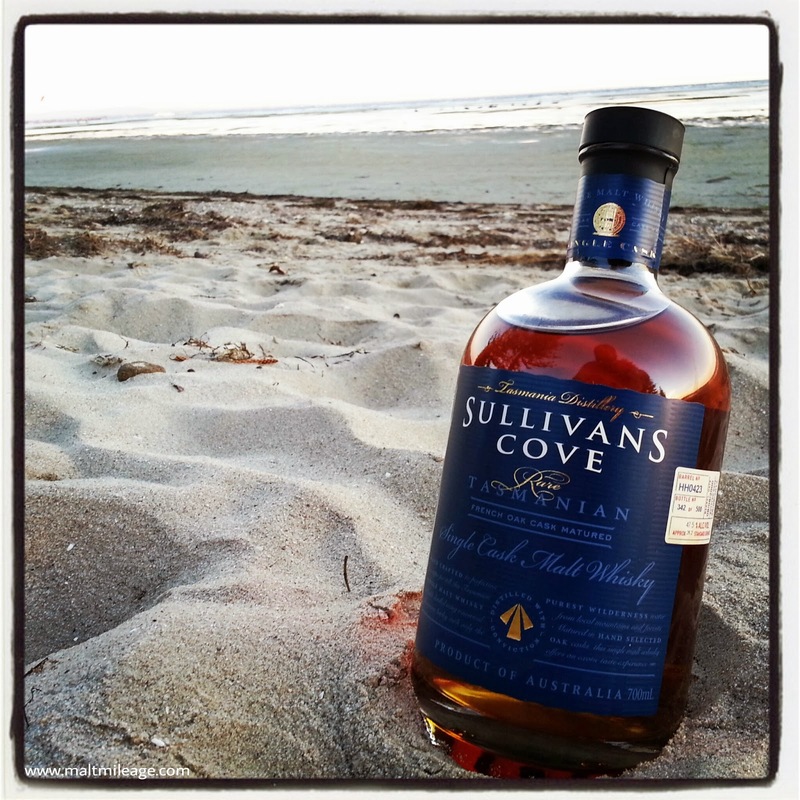 Sullivan’s Cove is arguably Australia’s most famous and decorated whisky distillery, winning a number of international awards for its whisky. 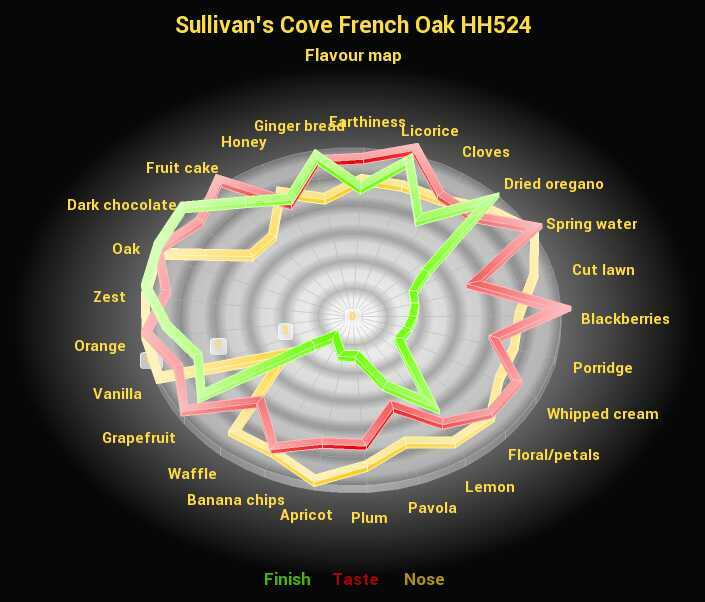 In my opinion, the Sullivan’s Cove French Oak HH524 is a superbly balanced whisky that bursts with varying shades of sweet stone fruit as the bitter oak and cocoa moderate it to allow spicy raw ginger and rich ginger bread to shine on the palate just as it is swept away by creamy vanilla which evapourates into a cloud of dry grapefruit that radiates off the base of the tongue. It is a great balance, lovely texture and some spark too! Sullivan’s Cove produces single cask whisky, which means that each of its whiskies expresses the particular character of the cask from which it was taken. That is just the nature of single cask whisky; some casks may contain the right mix of phenolic compounds that allow the whisky to develop into a magical whisky while other casks may have the wrong mix of phenolic compounds so the whisky does not develop in the same way. It just comes down to the cask, and the particular way the whisky has soaked up the character of the oak cask. Oak has hundreds of phenolic compounds that whisky soaks up while it matures in a cask, so it is pretty easy to see how the character of a whisky depends to a large extent on the oak cask. Oxidization, climate and distilling etc also play a factor, though you would expect the quality of distilling by Patrick McGuire and Co at Sullivan’s Cove to be top notch. As for the oxidization and climate, well, this should also be consistent with other casks give or take some different weather patterns during different maturation periods. 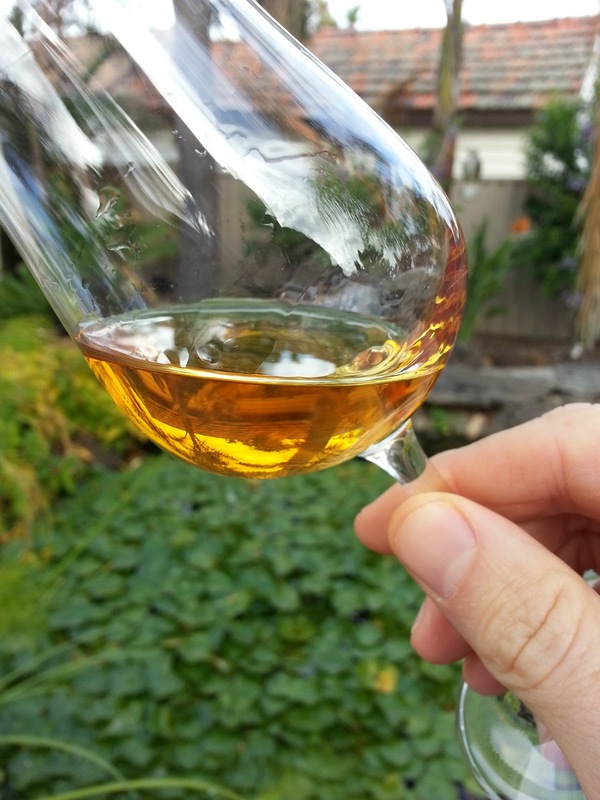 I cut the whisky down to about 30% alcohol volume, which releases a sumptuous fruit basket of flavour – basket and all – pulsating with fructose, lush green leaves, earthiness and the smell of fresh spring water. With water (~30%): It is amazing how much this whisky opens up with a splash of water. Nosing this whisky is like having a picnic under a peach tree when flowers are in full bloom on a lovely warm Spring day. The gentle waft of lush cut grass merges with a diverse bouquet of floral notes as the aroma of peaches freshly fallen from the tree mix with common picnic fare, apples, pears and luscious cream. Dense cheese cake also develops, as its crumbly biscuit base brings buttery shortbread and vanilla with notes of lavender. Neat (47.5%): If I could describe the taste as one thing, it would be a dark chocolate and ginger tart topped with strone fruits (apricot, peach, cherries), some banana chips and shavings of licorice, orange zest and smothered with cream and vanilla. That oak is just right, too. With water (~30%): Still sporting some kick even with water, the bitterness of dark chocolate and oak grapples with sweet stone fruits such as cherries as the layers of peach and apple begin to unfurl on the palate. This is sensational because not only can I taste the crisp freshness of apple and peach, but also the sugary softness of baked apple and peach crumble topped with dark chocolate and served in a lovely wooden dessert bowl. Rich custard also forms on the tongue, with creamy helpings of vanilla and sprinklings of aniseed. Neat (47.5%): Strong and powerful, the finish tingles the tongue as powerful bursts of dry grapefruit and oak merge with bitter dark chocolate and spicy ginger bread. With water (~30%): The finish is fabulous, lasting a long time but not overstaying its welcome.